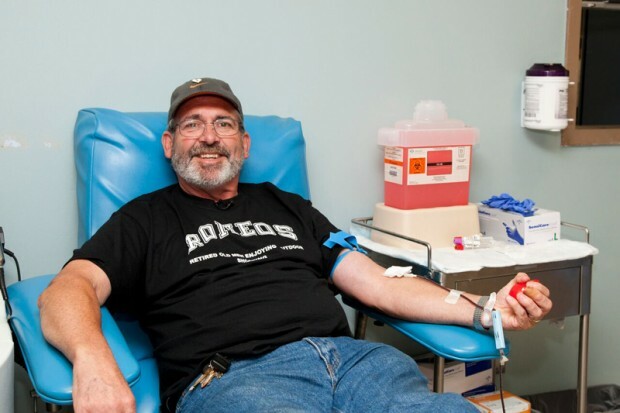 This Monroe man has donated so much blood he’s become a fixture at Good Samaritan Hospital. More than 450 people may be walking, talking, laughing and crying with Pat Heffernan’s blood running through their veins. Every couple of months since 1986, this Monroe retiree has donated a pint of blood at the blood donation center at Good Samaritan Hospital in Suffern, a member of the Westchester Medical Center Health Network. Heffernan has donated his blood 124 times — about 151/2 gallons. Healthy adults weighing at least 110 pounds can donate about a pint of blood every two months, depending on iron levels, according to the American Red Cross. Nationwide, more than 41,000 blood donations are needed every day. All this giving began while Heffernan worked at Avon’s Research & Development facility, about four miles down the road from the hospital. He led a local disaster- relief effort, packing Avon toiletries to help victims of the Chernobyl nuclear power plant accident in Ukraine, part of the Soviet Union at the time. While dropping off the package at the hospital, Heffernan discovered he could also donate blood. And 56 days after, he could do it again. And again. Ad infinitum. Photos of Heffernan hang in the donation room. He’s been on a first-name basis with staff since the beginning, walking from work to donate blood. Heffernan arrives at the blood donation center right on schedule to greet Franck, fill out the donation forms, get his vitals taken, roll up his sleeve and wait for Franck’s syringe to draw the blood that can give life to others. He alternates arms each visit, to prevent soreness. As Heffernan reclines in the lounge chair, he squeezes a red foam heart every five to 10 seconds during the 15-minute process. He gets the standard juice and cookies offered during the recovery period (to mitigate light-headedness and replace fluids), but no monetary compensation flows Heffernan’s way. This is the same hospital Heffernan has visited since he was a baby—for tonsillitis, stitches and a dislocated knee. “I’ve been at Good Samaritan Hospital for most of my emergencies,” he says. Donating blood is a simple thing Heffernan says he doesn’t think about much. It’s a habit, a habit that helps others. One pint of blood can save up to three lives, according to the American Red Cross.